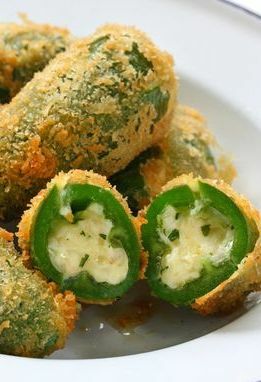 These Homemade Jalapeño Poppers Are Always The First Thing Eaten At Parties! What makes jalapeño poppers so delicious? They’re greasy, battered, deep-fried perfection. That mix of spiciness from the pepper with the salty-sweetness of the cheese and the breading makes this treat a winning combination at many restaurants. And they make for excellent, indulgent hors d’oeuvres and finger food as long as you provide napkins with them at parties. Jalapeño poppers are also surprisingly flexible. You can add ground meat or crab to the filling or even wrap the peppers in bacon. They are delicious baked or grilled, and can even be made without the breading. For this recipe, we’ll stick with the traditional poppers. Slice peppers in half lengthwise and cut/scrape out the seeds. In a bowl, combine the cheeses and garlic cloves. Stir until well blended. Spoon in the filling into each pepper half, distributing evenly. In a shallow bowl mix together flour, salt, pepper, paprika, chili powder, and garlic powder until the mixture is even. In a separate, shallow bowl pour the milk. Dip the stuffed peppers into the flour and roll until coated, then place on a rack to let the peppers ‘dry’ for 10 minutes. In a separate bowl, pour the panko. Dip the floured peppers into the milk then in the bread crumbs, then place them back on the drying rack. Let the peppers sit for another 5 minutes. Dip the peppers into the milk and bread crumbs a second time. Allow to dry again. While the peppers are ‘drying’ pour the oil into a large saucepan or deep fryer and preheat the oil to 350F.